Spring always feels like a fresh start, and this Ipsy bag gave my face the same feeling (and look). The samples this month offer the tools to brighten the skin and add a fresh glow! After hearing so much about this product, it was about time I finally got my hands on the Chella Ivory Lace Hilighter! In a neutral color, this pencil works for a variety of skin tones. It is brightening, but it does not have glitter or shimmer to it. It works like a brightening concealer. I like to place it pretty much anywhere around my eyes to brighten and make myself look awake. The next sample I received was a day cream by Acure. I do not like to change up my moisturizer. When I find something that I like, that works for me, I typically keep it and do not stray. I have to admit, I tried this out just to write about it here, expecting not to like it, but guess what? This has been my new go to since I got it; I really like this stuff! The thick cream melts right into my face and sheers out into a lightweight layer of moisture. Not to mention, it smells citrusy and invigorating. The cream claims to have an assortment of skin benefits, as well. Some of my all time favorite lip products comes from the next brand sampled, NYX Cosmetics. I received the Butter Lipstick in the shade Pops. This color is the perfect my lips but better shade! It goes on smoothly and has a nice lasting power. I like to layer it over some lip balm because it can be a bit drying on my lips. The Petra Mesmerizing Mineral Duo by Pixi is a beautiful shimmery duo. The warm tones will really complement a tan, so I am loking forward to trying it in the summer. The shadows blend easily, I used my fingers to use them to hilight and create an effortless eye look. This is the first time I had tried anything like these Skyn Iceland Hydro Cool Firming Eye Gels. They were really cooling and relaxing and I even noticed a reduction in puffiness after just one treatment. Very rejuvenating! 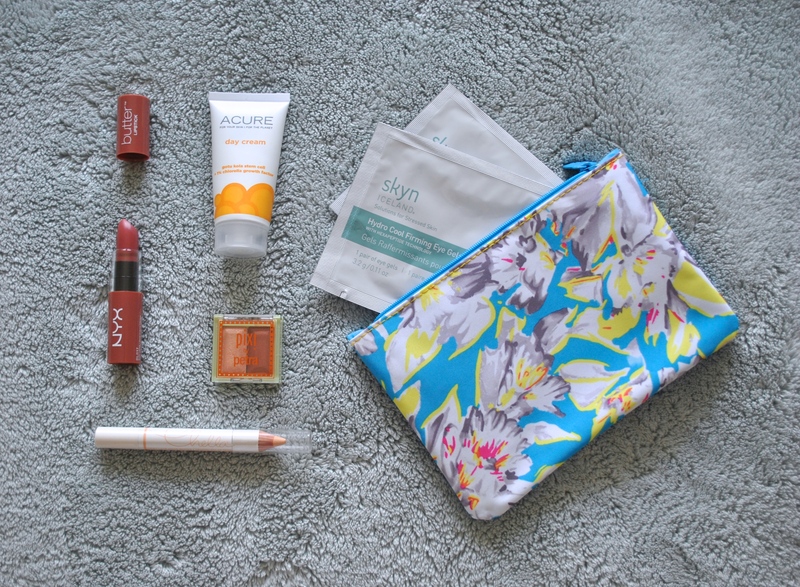 The theme of this bag seems to be obvious, fresh spring skin, and I am on board!